Hello from the most boring roadtrip ever. Marc and I are making a long trek from Reno to Vegas. I can’t quite figure out why rn, but we thought it would be a good idea to drive for eight hours instead of fly for one. In between Reno and Vegas, it’s essentially just a string of ghost towns. There are zero coffee places, and the only quick place to really eat is a Burger King halfway through the trip. I used to like this drive until I did it approximately 8,000 times in college. The redeeming factor is that Nevada has some beeeeautiful desert. We got up at around 4 a.m. this morning to miss all of college-kids-going-home-for-Thanksgiving traffic, so I got to watch the sunrise. Watching the sun peak over the Nevada mountains is honestly one of the best things ever. Now we’re halfway through the drive, and it’s taking extra long from a car accident that shut down the freeway. I’ve finished my travel mug of coffee. (Marc got up extra early to make it for me 💖). I was in desperate need, because I stayed up wayyyy too late last night. I make poor choices and chose to procrastinate on everything? Ugh, I know I’m the worst. Anyways, Marc hurt his back yesterday, so he took a prescribed muscle relaxer and passed out. I, unfortunately, drank too much coffee at work, leaving me buzzed as hell. (#killingit). So I packed, gave Bell lots of loves, and organized everything for the trip! I also cooked a whole pre-Thanksgiving feast for the car ride. Marc made some delicious roast beef sandwiches while I prepped a bunch of fruit. I made my carrot salad, got the water bottles filled, and popped some everything bagel popcorn. I also loaded the car with gifts for Marc’s family! 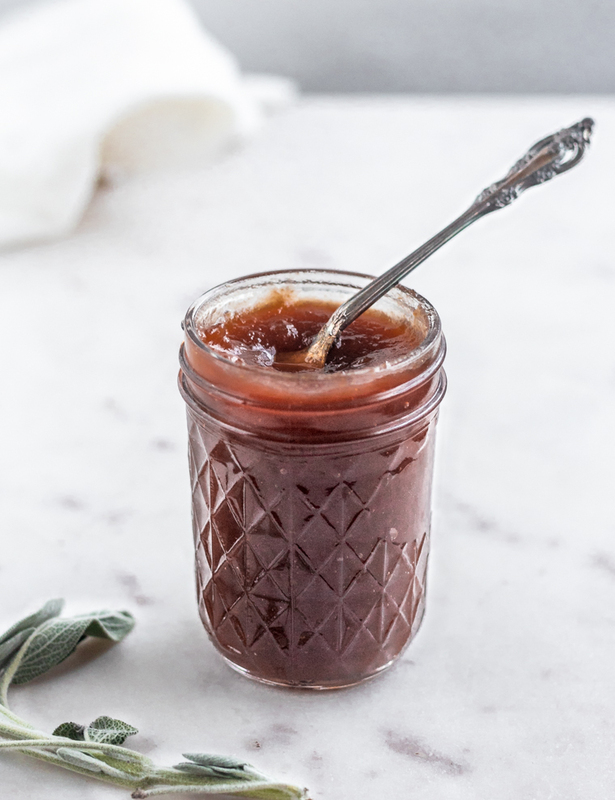 I’m rolling up to Thanksgiving armed with local coffee, black raspberry jam, and a big jar of sage apple butter. 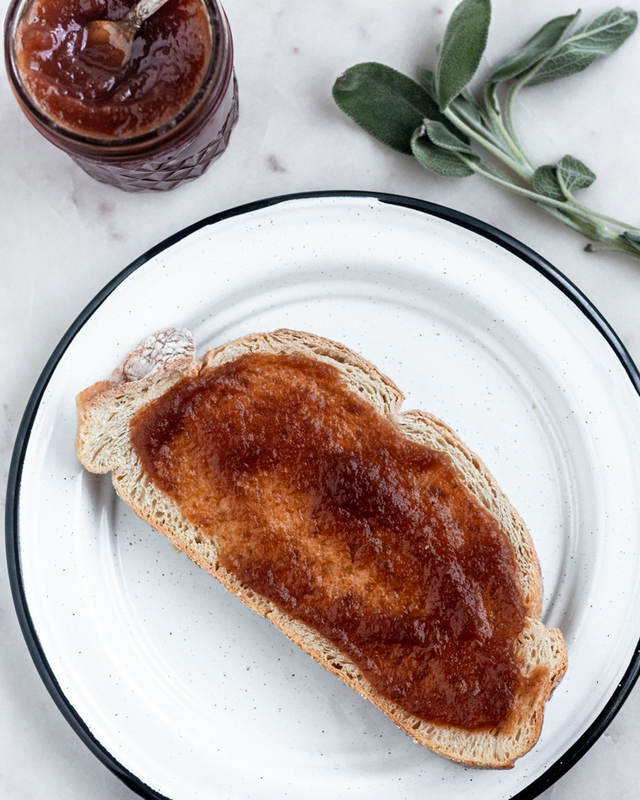 I don’t really know how sage apple butter came to be, but holy hell, I’m glad it did. Marc and I were tasting little spoonfuls all night. The only reaction he could muster was, “ooooh”. This is how I know when something tastes really good. I determine blog-worthy recipes purely from this reaction. When it comes to apple vs. cranberry, I will pretty much always go for apple. (It’s not u cranberry, it’s me). As much as I love cranberries, apples just win. I debated for a long time on whether I wanted to gift cranberry sauce or apple butter for Thanksgiving. 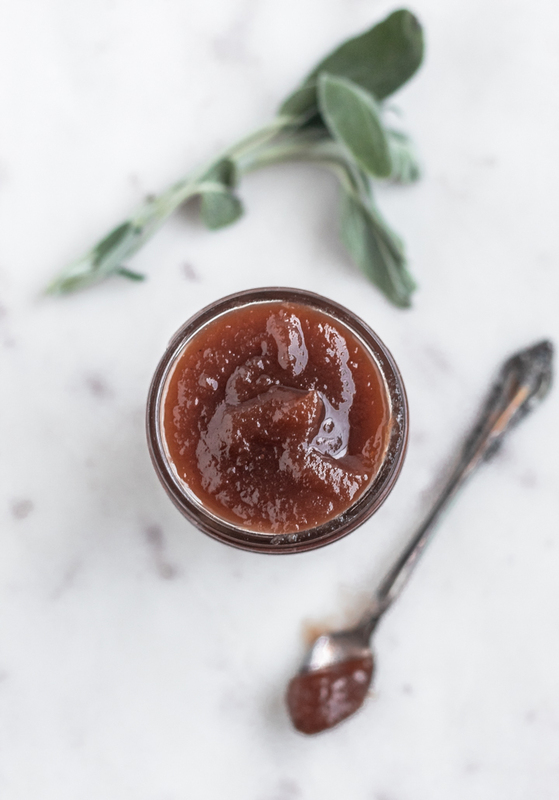 Apple butter obviously won, but it’s ok, because it’s extra Thanksgiving-y from the sage. Also, I think it’s what absolutely makes this recipe. I don’t know what it is about sage, but it just perfectly compliments every fall flavor. Apples, cinnamon, vanilla, brown sugar. Ughhhh, this is the stuff my dreams are made of. 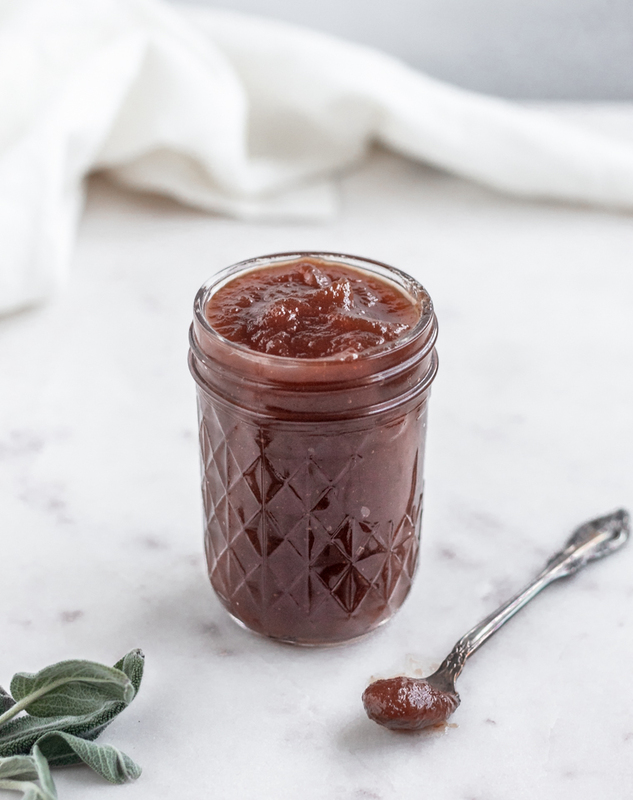 This apple butter has all of the best flavors of autumn and winter with warming accents including brown sugar, cinnamon, and vanilla. I make it in a slow cooker so it's super easy and hands-off! For this recipe, I like to use an even mix of Fuji, Golden Delicious, and Honeycrisp apples. Before making the butter, taste your apples. If they are exceptionally sweet, reduce the sugar by 1/4 cup. Serve over warm biscuits, toast, or on pancakes! In a small bowl, combine the brown sugar, white sugar, and salt. Place apples in a slow cooker, sprinkle with the sugar, and mix. Place the cinnamon stick and sage in the slow cooker. Set to low for eight hours. After about eight hours, check the apples. They should be broken down and releasing juices. Remove the sage leaves and cinnamon stick. Discard the sage and set the cinnamon stick aside. Using an immersion blender (or regular blender), puree the apple butter. If you're doing this in a regular blender, be sure to leave some space so it doesn't explode. Place the apple butter back in the slow cooker. Add the vanilla and cinnamon stick, stirring well. Cook for another two hours on high until dark brown and thickened. You can cook it longer for thicker apple butter. Remove the cinnamon stick and discard. 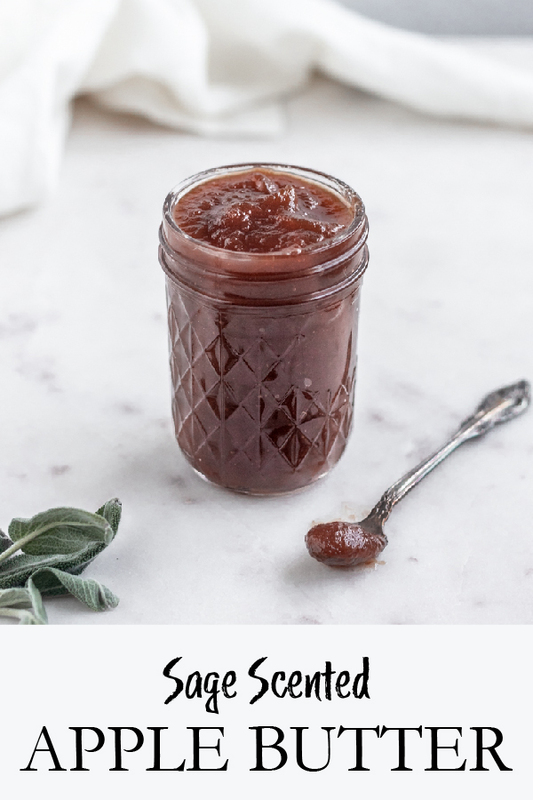 Cool the sage apple butter and store in jars for up to a week.